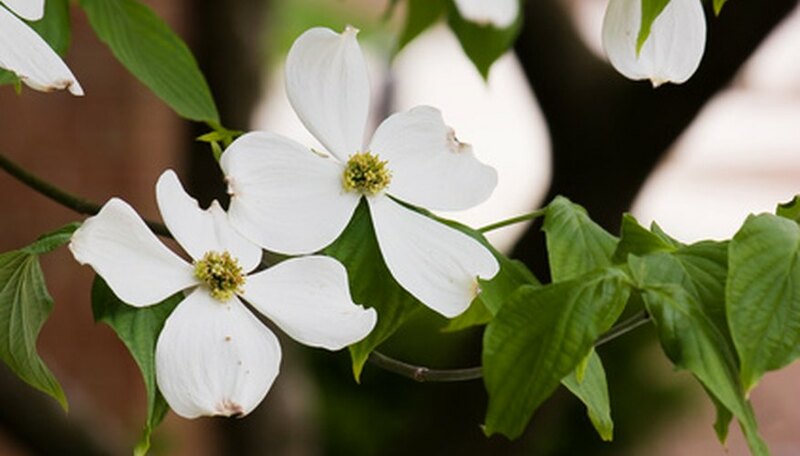 Dogwood trees are valued in the landscape for their showy white, pink or red bracts appearing in the spring and the deep green summer foliage. Red berries add interest in the wall. Dogwood trees grown in containers can be planted at anytime, but fall planting is recommended by the Alabama Cooperative Extension because it gives the roots time to develop before the heat of the following summer. Plant bare-root trees during the winter dormant season. Choose a well-drained site with moderate shade. Dig a large, wide hole, approximately three times the width of the container. Remove rocks and debris from the soil. Loosen the dirt and break up any large clumps in the removed soil. Add up to one third the soil volume of peat moss or leaf-mold to improve the soil, if desired. Plant the dogwood tree in the hole so that the tree is planted at the same level it was previously growing. Fill in the hole with the loose soil and gently press to firm the soil. Water the tree generously after planting. Continue watering weekly through the summer and fall as needed in dry weather. Apply approximately an inch of water to the area beneath the canopy of the tree and beyond. Mulch beneath the tree with 3 to 4 inches of organic material. Stake the tree to support it until the roots are established. Insert a 4-foot stake into the ground next to the trunk. Tie the trunk loosely to the stake with cotton twine. Wrap the tree trunk with tree wrap or burlap during the first winter. Fertilize sparingly during the first year. Small trees, up to 2 feet in height, need only one tablespoon of a good all-purpose fertilizer such as 12-4-8 in March and July. A 6-foot tree needs about 4 tbsp. Broadcast fertilizer onto the soil beneath the tree canopy, away from the trunk. Water after fertilizing. Avoid damaging the tree trunk with lawn equipment when mowing. Damaged bark allows entry points for disease and pests.